To evaluate the effectiveness of interventions in reducing falls and/or improving balance as a falls risk in multiple sclerosis (MS). Computer based and manual searches included medical subject heading keywords: “Multiple Sclerosis AND accidental falls” OR “Multiple Sclerosis AND postural balance” OR “Multiple Sclerosis AND exercise” OR “Multiple Sclerosis AND physical/physio therapy” NOT animals. All literature published to November 2014 with available full text details were included. Studies were reviewed against the selection criteria: P: Adults with MS, I: Falls management/balance rehabilitation interventions, C: Randomised/quasi-randomised studies comparing intervention with usual care or placebo control, O: Falls outcomes and measures of balance, Sixteen papers of the original 529 search results were included. Random effects meta-analysis indicated a small decrease in falls risk (RR 0.74) although the 95% confidence interval crossed one (0.12-4.38). Pooled standardised mean difference (SMD) for balance outcomes was 0.55 (0.35-0.74). SMD varied significantly between exercise sub-groupings; gait, balance and functional training interventions yielded the greatest pooled effect size (ES) (SMD 0.82 (0.55- 1.10)). There was a moderate positive correlation between programme volume (minutes/week) and ES (Cohen’s d) r= 0.70 (p=0.009); and a moderate negative correlation between programme duration in weeks and ES r=-0.62 (p=0.03). Variations in interventions and outcomes and methodological limitations mean that results must be viewed with caution. This review suggests that balance may improve through exercise interventions, but that the magnitude of the improvements achieved in existing programmes may not be sufficient to impact falls outcomes. 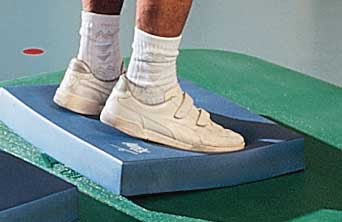 Supporting participants to achieve an appropriate intensity of practice of highly challenging balance activities appears to be critical to maximising effectiveness.